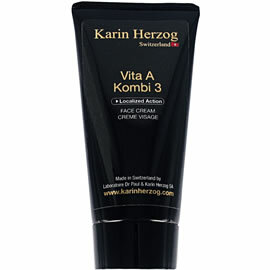 Karin Herzog Vita-A-Kombi 3 is ideally used to target specific skin problems, spots, and blemishes or areas of sun damage or hyper-pigmentation. Used by doctors and dermatologists all over the world to speed up the healing process, the internationally patented Vita A Kombi products work like no other to give unprecedented and exceptional results. Remarkable Karin Herzog Vita-A-Kombi 3 can be easily termed ï¿½lifeï¿½ for the skin, providing in each application the necessary energy in the form of Oxygen and the essential raw materials to create new healthy balanced skin at an accelerated rate. Regular use will undoubtedly promote optimum skin quality.